Welcome ! 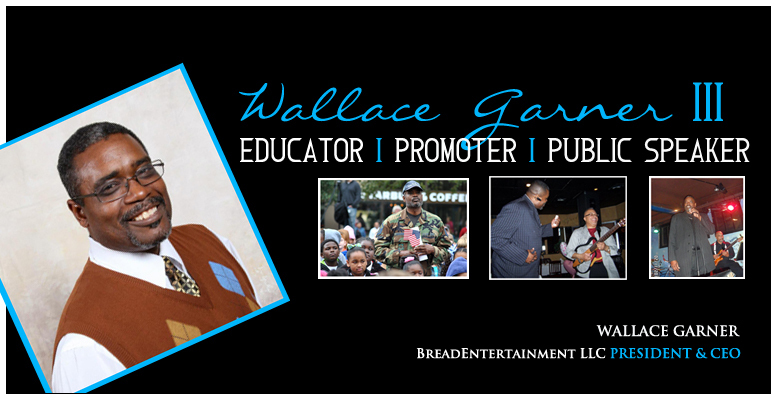 My name is Wallace Garner III. I am native to Louisville, Kentucky. I have been involved with some sort of entertainment since the age of four when I auditioned on the drums for the University of Louisville band director. I've been active in music since that time,though I have taken on many endeavors since. I consider myself a prodigy with jazz. I have been actively listening to jazz since the age of four. The other kids used to laugh at me. I knew there was something special about this music! The first piece I played on drums was "Poinciana," by the great Ahmad Jamal. Jimmy Smith, Wes Montgomery, Les McCann and Eddie Harris were among my early influences. I strive to be instrumental in bringing many great artists back to Louisville to perform. At one point, Louisviile was the mecca of music in this region. With your help, we can restore Louisville to the top.I bring formal radio training to you along with degrees in Transportation, Communication, Education and Administration. While attending college at The University of Central Arkansas, I started the radio show "The Afterset" in 1980. The Afterset brings a unique format to radio. I bring over thirty-three years of broadcast experience to the table. The Afterset can be heard each Saturday Night on Power 1350 am and praise 104.7 fm and Mixx 1240 WLLV at 9pm with a replay on Sunday nights t 8pm. Check out the link on this site to listen to recent broadcasts. I remain!